When I was eighteen I became pregnant out of wedlock. It was this crisis in my life that led me to true and genuine faith in Jesus Christ. Before then, I would have said I was a Christian, but I did not understand the grace of God. I thought I had to "do good things" to earn my salvation. Like Peter in the Bible, it was my "failure" that ultimately helped me see how beautiful the blood of Christ is! Amazing Grace! I wrote this book to encourage other young girls and unwed mothers who do not understand how much God loves them. In the book I explain the Gospel in such simplicity that a 3rd grader could grasp it. I also share about my battle to forgive the man who abandoned me during my pregnancy. Many people harbor unforgiveness. This book will help them. Your purchase of a book will help to support this web site. Thank you for all your kind comments on my visitor's page. I appreciate your partnership in this ministry. 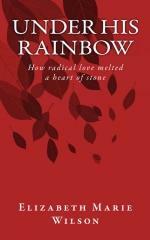 UNDER HIS RAINBOW, how radical love melted a heart of stone. A personal story about God's great love. FREE ON KINDLE THIS WEEK ONLY! THIS BOOK FOR FREE ON KINDLE!